Good morning kids. Friday and the weekend's here. In fact, today marks week 78 of the Trump presidential era - exactly 18 months of some of the most incredible accomplishments that are sadly marred by the ugliest, most dangerous time in our nation's history since at least the 1960s and perhaps the 1860s. And as is always the case, the danger is wholly caused by the Democrat party and the anti-American, Socialist Leftist movement that owns it. I believe that the times and the response to challenges during same are the measure of true leadership, and all things being equal, President Trump is on the path to becoming one of the most consequential (in a positive way) presidents of the past 50-100 years, if not ever. Look at the week that has passed. And every Friday it feels like deja-vu all over again because I'd swear I've written that same sentence at the end of the previous week. The latter began with the ginned-up hatred of Brett Kavanaugh at the outset only to be supplanted at the end by the arrogance and altogether weird performance art of Deep State hack Peter Strzok and his Greek chorus of Democrat stooges before the House Intel committee. And with their faces still glistening with meringue and feces from the pies and poo that were flung, a fresh batch was already being prepared for the President's Helsinki summit with Vladimir Putin. The Democrat-Left-Media Complex along with their Renfields in the Coup-Cucks-Clan warned him not to go. That is, they threatened him not to go or else. Of course, he ignored them and they all went insane, with cries of 'treason" irresponsibly hurled from all quarters for being conciliatory to a man who stole the 2016 election. Naturally, with the Mueller "investigation" into Russian "collusion" with PDT its main target only increased the insanity to eleventy-leven. In any case, had President Trump blasted ol' Vladdy in front of the world, the Left would've ripped him a new one for creating an international incident. And now comes the news that PDT has invited Mr. Putin for a state visit in the fall, perfectly timed for just before the midterms sot the voters can see the Left go insane before casting their ballots. If you put all of that aside, in normal terms the summit was quite successful. Mr. Putin is a thug who has political opponents liquidated, bordering nations (formerly Soviet or not) invaded and/or destabilized and submissive and has turned the Russian economy into his own business enterprise. Plus, they have nukes. We know what happened when Dubya looked into Putin's soul and saw a man he could trust, or some such idiocy. And of course, Obama's and Hillary's eagerness to sell America down the river. Trump's not stupid. He knows with whom he is dealing. And "dealing" is the operative word. We learned yesterday that Texas alone is now the world's third largest petroleum producer (plus PDT ripped Merkwurdige Merkel a new one for the secret gas pipeline to Russia) and the Syria/Iran situation is no doubt hammering and sickle-ing ol' Vladdy as well. And the Chi-Coms issuing an official warning to Moscow that the Trump Administration won't be around forever means that they're worried about the prospect of Russo-American rapprochement. So behind closed doors there could be some very interesting geopolitical maneuvering that we're not privy to, Deep State State Dept. leakers notwithstanding. ...Before November 2016 Democrats "never met a communist they didn't like or a Russian they didn't want to embrace, Walsh wrote. Not surprisingly, Comrade Sanders' ties to Russia are much more substantial than any ties President Trump may have. Bernie's top 2016 presidential campaign strategist Tad Devine is mentioned 16 times in a list of 500 newly disclosed potential exhibits that Special Counsel Robert Mueller may use in former Trump campaign manager Paul Manafort's upcoming trial for failing to register as a foreign agent and related offenses. According to the emails in evidence, at one point Devine was in regular contact with Russian intelligence agents. Devine was a lobbying business partner of Manafort and previously worked for the pro-Kremlin president of Ukraine, Viktor Yanukovych. Devine also previously worked for Sanders in the 1990s and as an aide to Al Gore, John Kerry, and Michael Dukakis on their respective presidential campaigns. 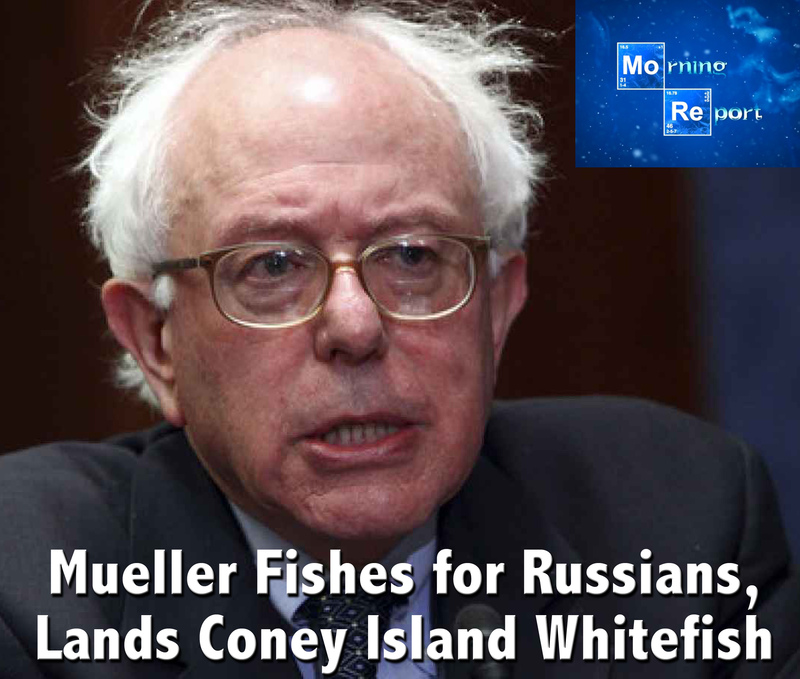 Bernie may seem like a farschimmelt, meshugina alta-cocker with a rumpled suit, geriatric funk and halitosis, but make no mistake; he's dangerous, as is his acolyte Dem-Socialite Occasional-Cortex. Too many people listen to them and nod their empty heads in agreement. In any case, I have not scanned the headlines of the Dem-Agitprop media this morning but something tells me that this story will be nowhere to be found, and certainly buried somewhere in the classifieds, if at all. Meanwhile, as Paul Manafort rots in jail for all intents and purposes as an actual, dictionary-definition political prisoner, Obama, Clinton and all of their underlings and henchman who sabotaged America and American interests to Russia and others ideologically or for monetary gain are free as a bird, their praises sung on TV, newspapers, film and in the classroom. Feh. In fact, James Clapper, Obama's DNI and one of the key operatives of the current coup against President Trump, admitted that it was Obama who effectively set up the entire Mueller investigation. And in a not wholly unrelated piece, as it redounds to the attack on PDT for not defending his intel and LE agencies, we have a golden oldie of Clapper declaring the Muslim Brotherhood a secular organization that has renounced terrorism. TOP. MEN. Aside from that Adam Schiff is a grandstanding, pencil-necked little worm. Moving along to other topics, in the Civil War 2.0 category, a planned protest at Maxine "Polluted" Waters' LA HQ by the Oath Keepers had to be cancelled as counter-protesters (read: Black Panther goon squads) showed up and starting making threats and burning the US flag. I guess we have to trash America in order to save it. A group of miscreants is trying to interfere with Trump's private business concerns by having the liquor license revoked at one of his hotels, the Left's obsession with images (so far) of beheadings, a couple of excellent essays on the nature of "Progressive" tactics including Mark Levin who does the deep-dive into history and calls out the "Progressives" for what they are: tyrants. In politics, a look at a potential Dem field for 2020, an Alaskan Dem candidate for the House has never even been to the state (hey, open borders! ), the Dems are now officially the party of open borders, and as the last link warns us, now the party that will reject any and all electoral losses as evidence of cheating and rigging. What was sown in 2000 and 2004 has now metastasized to 2016 and beyond. It's a lead pipe cinch that if (now more likely when) the GOP crushes the Dems in the midterms, this will be the battle cry. You think Waters et al are bad now, you ain't seen nothing yet. And related to that, Limbaugh has now doubled-down on his prediction that eventually, the Dems will call for an abolition of elections. Maybe sooner than we think even. On the international scene, Secretary of State Pompeo is set to deliver a major speech on Iran which is seen as the announcement of policy vis a vis support of those in country seeking to oust the mullahs. With that, there is some discord in the administration of exactly what that support will look like. Also, there is news of an arrest being made of a Brit who was plotting to assassinate Theresa May. Evidently his co-conspirators were FBI agents. Domestically, it's a bit of a mixed bag. Weekly unemployment claims are at the lowest level since 1969 and PDT has signed an EO authorizing a major apprenticeship program for the private sector. On the down side, the President is pissed that the Fed is going to raise interest rates, supposedly to stem inflation but more likely to throw a wrench into the booming economy. And while Mick Mulvaney has done wonders taking a tomahawk to Fauxcahontas' CFPB politburo, Labor Secretary Acosta has been a failure at his job, to the joy of Leftists. But, over in enviro-communism news, a federal judge has tossed NYC's/DeBolsheviks insane anti-oil company lawsuit and Tom Steyer's green energy ballot initiative in Arizona may get dumped because of signature gathering fraud on the petition. That said, this carbon tax bill is gaining support from RINOs and Cuckservatives. I hope PDT calls it out as DOA. From hither and yon, as the NFL decides to continue to commit social justice suicide, the Miami Dolphins have announced fines and suspensions for kneelers. Too little too late, IMHO, and I can't see Goodell letting that stand anyway. Obama screwed the pooch before eating it in South Africa, some schmuck Disney filmmaker is a racist and homophobe but of course gets a pass, and New Jersey governor Murphy evidently treats the players on the soccer team he owns like abject crap... "For the People!" Rand Paul Blocks Bill Brimming with "Trump Derangement Syndrome"
"Different Set of Standards for Clintons" Circle Drives Americans "Crazy"
Levin: "Progressivism is a Form of Tyranny... Of Course They're Attacking You!" Judge Tosses NYC Lawsuit Blaming Oil Companies for "Climate Change"